Carlos Falchi blue python clutch bag that includes a silver tone chain. 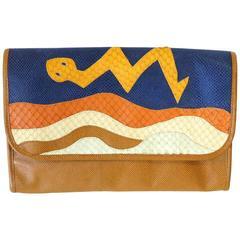 Blue python snakeskin clutch bag with magnetic snap closures under front flap and detachable silver-tone chain strap. This clutch is lined with blue embossed leather at flap and the interior compartment with a floral fabric and it contains one side slip pocket. This bag in pristine condition. Made in Italy. Carlos Falchi Oversized Clutch with Black/White Animal print. Made of leather and animal hair. 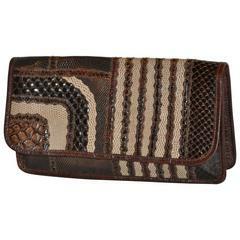 Carlos Falchi Leather Clutch with Fold Over Flap Closure, Multi Colored Aztec Pattern, and Leather Knotted Strap.